Rich in both detail and topographical terrain, our 3-Panel Teal Dream World Map has it all! The soothing ocean colors subtly highlight the beauty of the ocean depths, while the lighter color of the landmasses ensures the continental terrain is on full display. Highly detailed, with country capitals listed and all 50 US states outlined and labeled, it’s easy to pin your US travels as well as your world expeditions. Antarctica has been removed from this map in order to provide the most amount of pinnable space. Printed on premium canvas, this interactive world travel map with pins is our own exclusive design and has a rich canvas texture and modern, frameless 3-panel gallery wrap design. 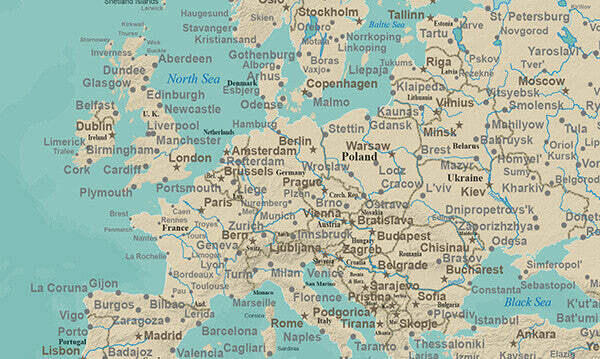 The extra-large size of this map gives you larger fonts and more surface area to pin your travels. Reminisce about past vacations and dream of future ones with each new pin you add to your teal world map! In no time at all, your Push Pin Travel Map is sure to become your favorite conversation piece. Personalize your map with your name and/or favorite quote and your text will be printed directly on the map itself, giving you a one-of-a-kind work of interactive art. 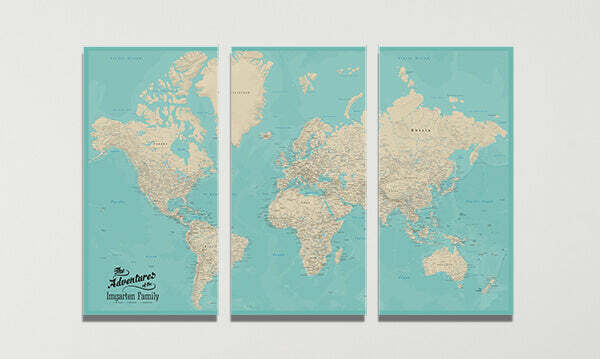 This 3-Panel Teal World Map on canvas makes an unforgettable gift idea for any traveler in your life!